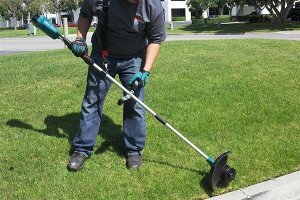 While the previous model looked like it would work well for your average homeowner, the new XRU04Z Brushless String Trimmer has the look of a tool made for professionals. Boasting up to 90-minutes of runtime on a single 3.0Ah battery, it has the stamina to tackle more than just one yard. No engine means no fuel, or oil, or all the weight that goes with it, so the string trimmer and battery only weigh 8.6 lbs.